If you've decided it is time to start walking for health, fitness, and weight loss, you've already taken a great first step. Walking is an effective, natural way to achieve the daily physical activity amount recommended for weight management and good health. Walking helps you burn calories and fat, which is necessary for weight loss. The recommendation is 60 minutes a day a few times a week. Generally, for a 160-pound person, walking will burn about 100 calories per mile. Best of all, it's cheap—no expensive gym membership needed—and it can be done anywhere. Combined with a balanced diet, you can start achieving your goals. If you're just getting started, take some time to familiarize yourself with the basics. Once you get going you can work your way up to walking comfortably for 30 minutes to an hour, the level of physical activity recommended to reduce risks of heart disease, type II diabetes, breast cancer, colon cancer, and more. It may feel like walking is too low-impact to have a meaningful effect on your weight, but that's not true. Especially if you're just starting out, running may be too much too fast and is also not the best weight loss exercise for everyone. Ultimately, it comes down to your situation and needs. Know that a walking program is effective exercise and can lead to weight loss with proper calorie balance, so you shouldn't feel like you're not doing enough. In fact, it may be easier to stick to a walking plan instead of a running plan. Preparing to walk: Learn what you need to do before you begin a walking program. This may include getting medical advice, investing in basic walking gear like shoes and clothing, and more. Walking Technique: Next, you will learn good walking technique, focusing on proper posture, use of arms, and leg motion. Walking Schedule: Determine how often to walk, how fast, different types of walking, and how far to build up to the level of 30-60 minutes per day. Staying Motivated: Explore techniques for keeping yourself walking and avoiding common mistakes. All of the advice included is good for walking either indoors or outdoors. To begin, we'll see if your body has any special needs before starting an exercise program. Then it's on to gear-up with clothing and shoes. Once you're more advanced you can incorporate jogging or interval training to add some strength training and variety. But should you focus on strength training along with your walking for weight loss routine? Strength training can help you burn more calories and there are benefits for your metabolism, muscles, and more. As you get more comfortable with your walking routine, consider adding a day of weightlifting to reap the benefits. Alternatively, try walking with weights—but make sure you do it right! Popular ankle and wrist weights are actually not recommended. There are more effective ways to use walking weights, with lower risk of injury. The important thing to remember is to be realistic. Don't be harsh on yourself if you can't go long distances right away—you'll work up to them! Especially if you're new to exercise, focus on starting slow and consistency. You'll notice your body getting stronger as time goes. One helpful technique is setting SMART goals. 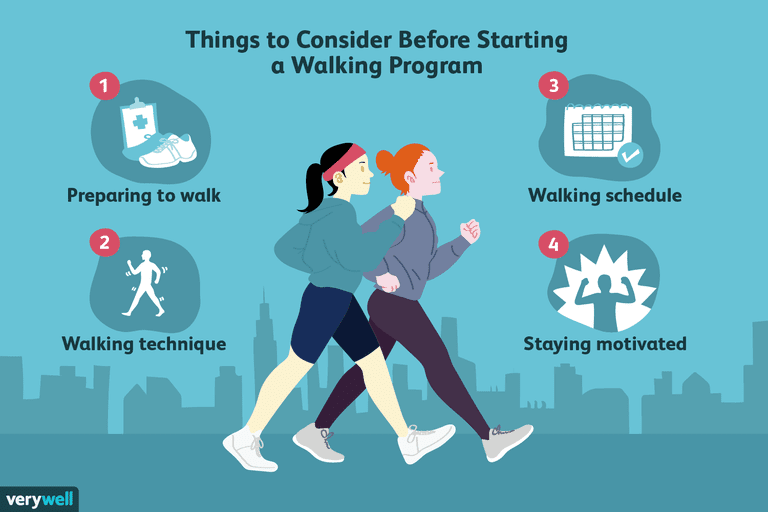 These are specific, measurable, attainable, realistic, and timely goals that will help you structure your walking and give you something to work towards. Also, modify as you go based on how you feel and what results you're seeing. If your plan isn't working, regroup and evaluate. Once you have the go-ahead from your doctor (if needed), you should start exploring gear and technique. Start small—a few basics will be enough at first and then you can invest in more down the line.